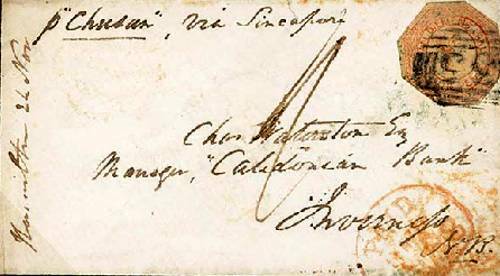 Under the command of Captain Henry Down RNR, Chusan was the first P. and O. steamship to operate a regular mail ship service between the United Kingdom and Australia, via Singapore. She was also only the second steamship to trade in Australian waters, the first being the paddle-wheeler Sophia Jane in 1831. Built in 1848 by Miller, Ravenhill and Salkeld ,Low Walker, of Newcastle, England for the P. and O. S. N. Co, Chusan was a barque-rigged steamer of 699 gross tons, fitted with an 80 hp engine, capable, unassisted, of giving her a speed of 9 knots. With the aid or her sails, the vessel was claimed to be capable of 14 knots. For self defence, Chusan was armed with a 32 pounder naval cannon, mounted aft on a traversing carriage, that was able to train to port and starboard, together with an 18 pounder, also on a traversing carriage, mounted on the poop deck. 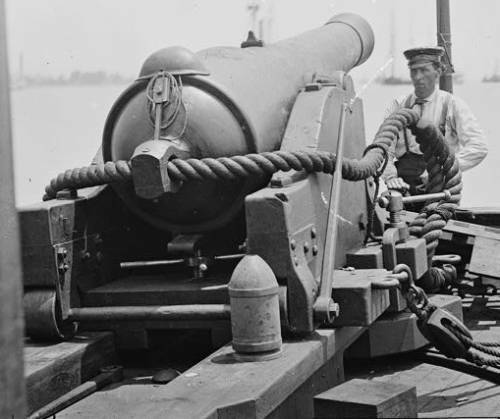 32-pounder cannon, mounted on a traversing carriage. Four broadside Royal Navy pattern 12 pounders on the forecastle, and 6 swivel guns around the poop rail completed her armament. She was also equipped with steam hoses. This impressive firepower was for protection against the pirate junks and swift prahus which prowled the China and Java seas in the 1850's. 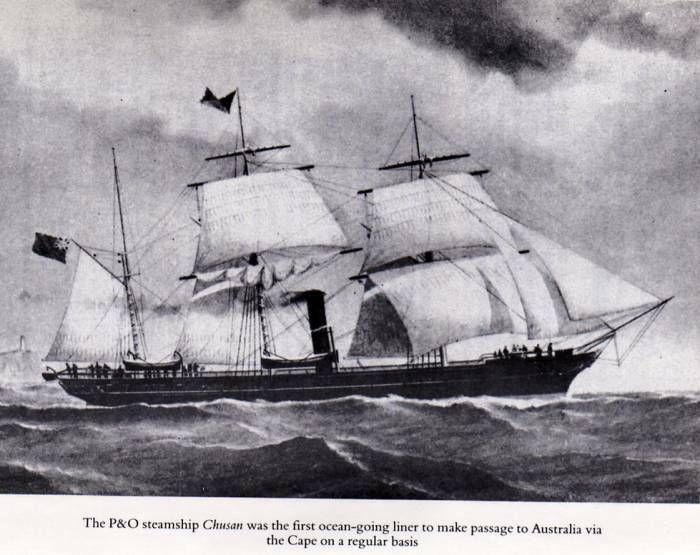 Chusan was the first ship to carry mail from the United Kingdom to Australia under contract to the Chancellor of the Exchequer. 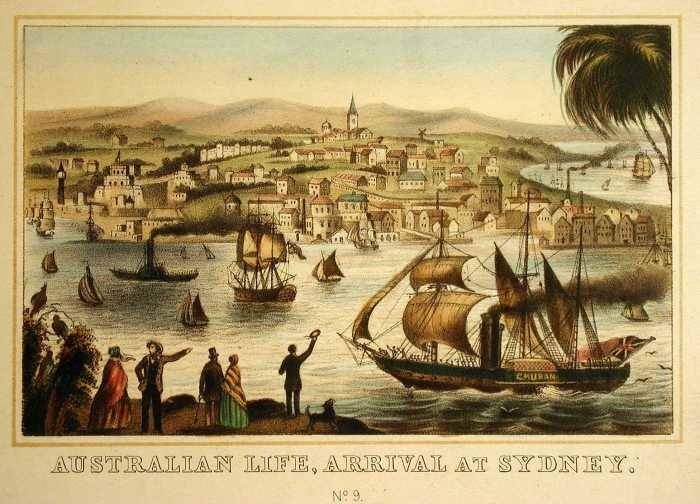 On the first inaugural voyage, she left Southampton on 15th May 1852 ,and arrived in Sydney on the 3rd August. Her arrival was greeted by large crowds at the dock, a subscription ball and supper was arranged, and a specially composed 'Chusan Waltz' marked the occasion in fine style. The voyage took 80 days, compared to the usual 121-130 days. 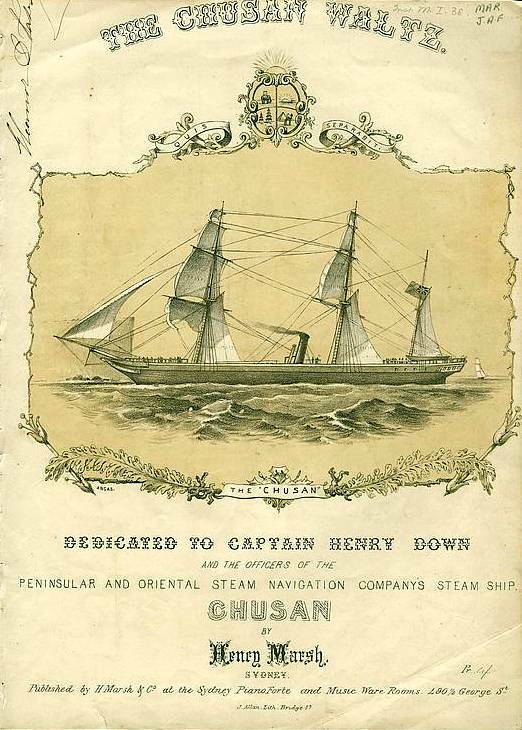 Chusan ended her P. & O. career in 1861 when she was sold to David Sassoon & Sons of Shanghai, and sold on again, in 1866, to Feudatory of Matsuyama. She was finally sold to Chosu Dan and renamed the Kayo Maru and converted into a warship, before finally being broken up in 1870. At 4,636 gross registered tons, the 2nd Chusan measured 400 by 45 ft. The second ship to bear the name, Chusan, was built by Caird & Co of Greenock. Sister ship to the Tasmania, Coromandel and Bengal, she was launched on 7th August 1884, entering Company service on 6th September on the India run, departing London on the 24th, bound for Calcutta. Designed for rapid conversion to an armed merchant cruiser or troopship if required, she was built without any Government subsidy, and had watertight doors with the mechanism well above the waterline. 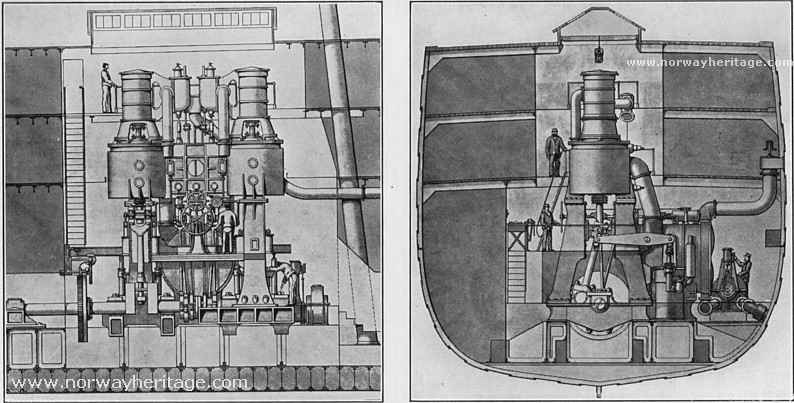 Smaller than contemporary ships, Chusan and Tasmania were fitted with inverted compound engines, where the more normal, vertical cylinder, is positioned upside down. Chusan's passenger accommodation was comfortable, although less ornate than those of the vessels on the Australian run, though she had electric light throughout, and was a great favourite with the travelling public. With a service speed of 14 knots, she could carry up to 111 First Class and 42 Second Class passengers. since then the sea has been very smooth, quite like the lazy Hudson in summer." Note the ensign, flying upside down, indicating ship in distress. 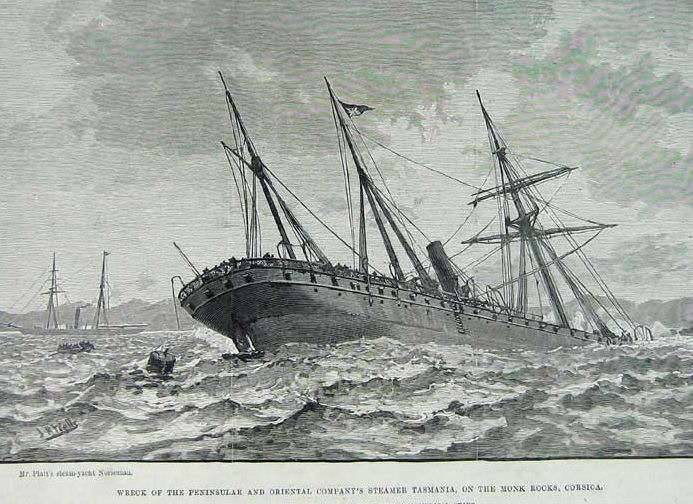 In April 1887 she brought passengers from the Company's ss Tasmania home from Marseilles, after she was wrecked on the south coast of Corsica, with the loss of her captain and 34 passengers and crew. 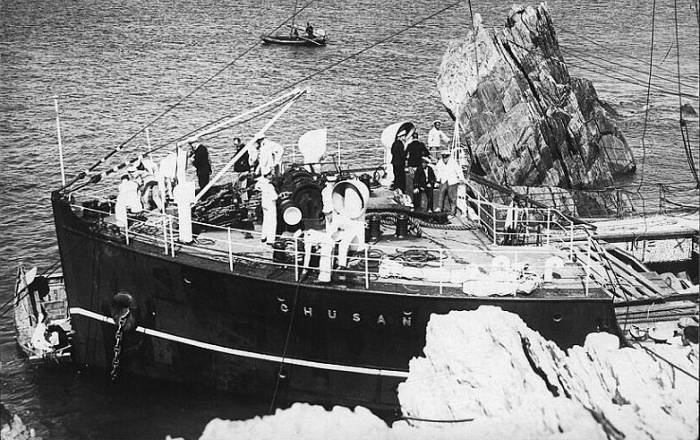 On 28th January 1885, P&O's ss Chusan was stranded near Perim lighthouse but towed off by the Company's ss Thames at the second attempt. 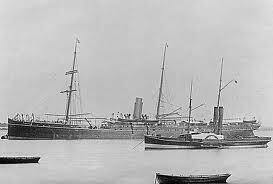 On 30th September 1892, Chusan was rammed by an inbound Swedish steamer when leaving London's Royal Albert Dock. She returned to the dock for minor repairs, before sailing on 2nd October. On 25th July 1894, she salvaged the disabled sailing ship Falls Of Ettrick, a four-masted steel barque built in 1894 by Russel & Co, of Port Glasgow. towing her into the Hughli River, Calcutta. In 1902, Chusan was transferred to the Far East trade, before being sold to Indian owners in 1906 and renamed Shah Najaf, serving on the pilgrim run to Mecca. She was eventually broken up at Bombay in 1907. Not to be confused with P&O's ss Chusan! 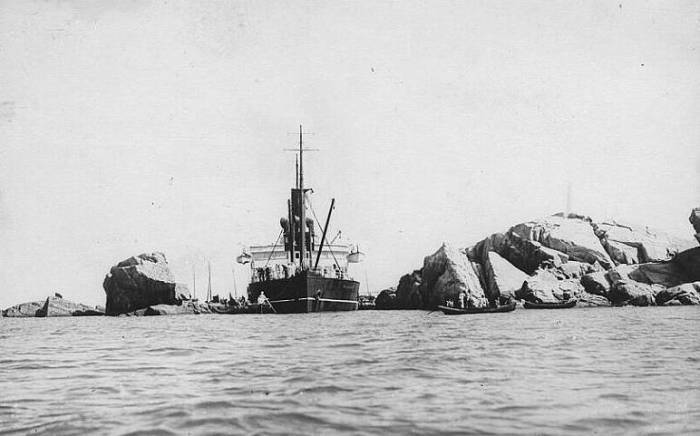 The China navigation Company's ss Chusan, en route to Shanghai, ran aground on 31st October 1932......between two rocks near Wei-Hai-Wei Island - at the time used as a British Naval Base in North East China. Ordered in May 1946, the third Chusan was a smaller version of the P&O Company's Himalaya and was designed as the principal element in the postwar regeneration of P&O's Indian and Far East service. Considered by many as a long overdue replacement for the celebrated Viceroy of India, sunk in November 1942 by the German U-boat U-407. Like her celebrated predecessor, she introduced superior standards, which were much appreciated by the good people of postwar austerity Britain, on the routes to the Orient and the Far East. Chusan now has her own web page, with lots more info and photographs! Please click the above link to navigate.